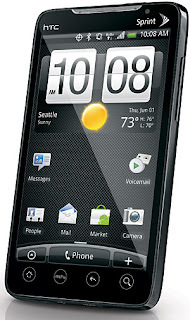 HTC EVO 4G is the First 4G compatible (supported) mobile Phone in USA. 4G is still have to launch. In so many countries 3G is still not launched. In USA the first Nation wide 4G is going to be released by SPRINT. With 4G you can experience 10x faster than 3G. Coming to HTC EVO 4G, It has many features. Dual Cameras- 8MP & 1.3 MP. Micro SD card ( upto 32 GB). Kick stand for easy media watching. Download, view, edit, share HD quality content from your phone. Android apps with morethan 30,000. The Price of the phone is $200 (on Contract) available from June 6th this year. Market people are saying this Phone will make a brakes to Apple iPhone sales. Will it?? ?